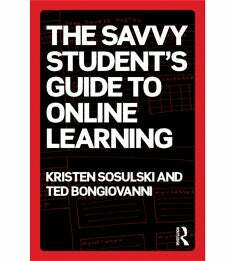 In their new book, Kristen Sosulski, Clinical Assistant Professor of Information, Operations and Management Sciences and Director of Stern’s Center for Innovation in Teaching and Learning, and Ted Bongiovanni, Administrative Director of the Sheikh Mohamed bin Zayed Scholars Program and the NYUAD Summer Academy at New York University Abu Dhabi, introduce the information and skills required of successful online students. The book aims to prepare students for contemporary online learning, covering topics including online student expectations, providing feedback, creating an online presence, interaction and communication techniques, online group projects, individual work, technological requirements, how to get technical support, online classroom "netiquette" and time management. Undergraduate students also contributed to the book through the Stern Program for Undergraduate Research (SPUR), established by Geeta Menon, dean of the Undergraduate College. Both authors were recognized as the “Routledge Authors of the Month” for June 2013. Kristen Sosulski is a Clinical Assistant Professor of Information, Operations & Management Sciences and the Director of Stern's Center for Innovation in Teaching and Learning.